I have 2 80’s one alliance, one horde. One is a farming Dk and another a sweet and loveable shaman. I’ve bought three epic fliers in my time of playing. I have a 2 full guild bank tabs as well as being full up on my character’s bank tabs and quite a few thousand gold. When it comes to gold for alts I am in a word : OK. I was not doing it for twinking purposes. Or speed leveling. Or doing it because it’s lawleasy. Or doing it because questing is easy or boring. I’ve done the questing in Northrend on top of having 2 80’s, a 72, a 73 AND a 74. I was merely just seeing how the leveling went in bg’s. 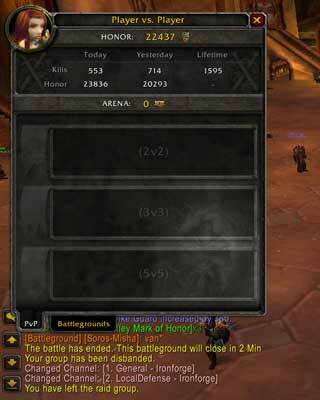 So, I took the level 74 mage into an AV in the Battlegroup “Whirlwind”. I wouldn’t say Alliance Dominate in my battlegroup in all cases but we do well. It’s a pretty even split. Not like say the cyclone battlegroup where 90% of the victories come in AV and the rest is just a horrid grind for marks. In any case I put on my heirloom shoulders for the +10% xp and then checked the daily bg. It was AV! Nice! I sign up. As usual we head down towards Galv,the first so called boss in AV. We down him in under a minute. 19k xp pops up on my screen as well as 300xp for killing him. WOW. Really? Next up the towers. Iceblood and Towerpoint. I skipped IB then ran to tower point and clicked on the wing commander and let his smelly self run away ASAP. Pppppppp-uuuuuu. I step out, mount up, and run towards the base. I’m one of the first to arrive. I run into the west tower, or is it east, and click on the next wing commander and away he goes. Next up, running and capping the tower. Check. The rest of my friends arrive and we clear out the base. Just as iceblood’s tower burns, 19k xp pops up. Holy smokes. Tower Point right after that. 19k. holy cow! That’s three quests in 5 minutes of my time! Then 6k pops up, and shortly after another 6k. It’s an XP extravaganza going on! I found out later that the 6k was coming from returning the wing commanders to the base. After some standing around east and west burn. 19k each! We head inside for drek. After a quickie 26k pops up! WOW. All told 133,000 xp for a 15 minute match. Let me rewrite that. 133,000 in 15 minutes on top of honor gains which came to about 1500 honor. WOW. I’m ABOUT this kind of leveling right!!? Well here comes the downside, and it’s to be expected so, it’s not really a downside. XP gains like this are not like this every match. Sometimes the wing commanders will get killed. Sometimes horde will backcap you, causing you to lose TP or IB. And then there will be the times you just flat out lose. I cannot stress how many times galv was fiercely defended. No matter if the kiddo’s in the bg chat said RUN BY, it meant horde were turtling and even if you did you’d still have to contend with 4 towers which will be fought for. It’s a turtle. Accept it and wait the 30 minutes for the fight to end. This happened late friday night, about 10pm to 12. And also on saturday and co-incidentally on sunday. I’m going to guess that “bedtime” co-incides with this. But that’s just a arrogant guess. Sure I could have “farmed” hk’s but that’s not really my stylie right now. I”m here for xp. So never one to sit around idle like that I headed to the harpy cave. Since n oone was around to leech the xp I was getting about 1k a kill. Not too shabby. So I just cleared the cave and waited for it to all end. So lets fast forward to Sunday night. I ended up hitting level 80! All told, it was about 22-24 hours of gameplay to go from 74-80. I ended up getting about 80k honor in that span as well. Heriloom items do not apply to Battleground XP gain like tower capping, boss killing, flag captures. They do however stack with…..
You will get xp for killing any npc. So stick around the graveyards for xp gains and the towers. Try to pull some of the elites while waiting at the base. That’s xp. It’s not much, maybe a few hundred each. But a few hundred times 40 matches equal’s a lot. We’re all mathy nerds here anyways right? Don’t forget the quests for AV out of the Alterac base camp in Azeroth. I hit exhalted and got 4 quest completes for upgrading the trinket. Gold and Xp. Score! Daily quest. It’s gold and xp. No brainer there. At level 79 1/2 I headed to Zul’drak for the amp of anguish quest chain. It’s easy, takes about 30 minutes to totally complete and gives a boat load of xp. It didn’t detract from leveling all that much. The xp gains obviously vary as you get higher in level and rest xp is not eaten while in bg’s. So the emotion goes from from WOW to oye quickly. At 74 I was pulling in rougly 2 1/2 bubles a match on victories mentioned above. At 79 I was lucky to pull in 1 1/2. At 78 don’t forget your Blue PVP set. You’ll get torn to shreds until 78 with your grappy level 70 quested gear. All told I’m very happy now with my freshly minted 80. She’s all trained up, equipped with some PVP epics and all ready to go! I want to add that I took a level 70 paladin into a BG and god 5600xp for killing drek. Hardly worth the effort. I’d like to guess that it’s the 71-80 AV bracket in battlegrounds where alliance wins AV so maybe we’ll be lucky and not see blizzard change this. Maybe? And lastly, here’s a picture of a Gnome Warrior I saw on a Hog. Look at the driver of the next hog you see, well over half of the time you’ll see a Warrior in one. It’s almost a requirement if you’re a warrior. I don’t really know what Mighty Muggs are, but these Star Wars toys are pretty cute. And they can be yours! From Craftzine.com: Lucasfilm asked artists, comic book creators, toy designers, and celebrity fans to transform blank Mighty Muggs into custom art depicting their favorite characters, creatures, ships and scenes from the Star Wars saga in the project, The Empire Muggs Back. Then collectors and fans can bid on all the art pieces which are auctioned by The Make-A-Wish Foundation. Hurry, the action ends on Aug. 14, 2009! When you become a new mom or dad, you’ll probably have little time for your video games… so why not get your fix by dressing up baby like your favorite Nintendo character! I love this little knitted Link outfit.